Codified at 14A V.S.A. 10-1013, the certification of trust is a document signed and either presented or recorded by a trustee in order to give notice to parties outside of the trust arrangement that a trust exists and that the trustee has the authority to enter into the transaction at hand. The certificate is made in lieu of recording the entire trust instrument, and is effective "as though the full trust instrument had been recorded, filed, or presented" (14A V.S.A. 10-1013(b)). The certification of trust presents the trust's name and date, the names of the trust's settlor and original trustee, the name and address of the acting trustee, and a summary of the relevant provisions of the trust authorizing the trustee to act in the transaction at hand. The document contains certified statements made by the executing trustee that the trust exists; that there are no provisions of the trust instrument which limit the powers of the trustee enumerated within the certificate; and that the trust is either unsupervised by a court, or, if supervised, the trustee has obtained the required approval to act. A certificate of trust is recorded in support of business involving trust property. When the document is used in real property transaction, a legal description of the subject property and parcel identifying information should be included. All documents pertaining to real property are recorded at the municipal level in Vermont, with the exception of Buels Gore, which records via the Chittenden County Clerk. The document must meet all state and local requirements relating to form and content, and be properly notarized before recording. A certification of trust "provides the person relying on the trustee's authority [with] a level of protection". The sworn statements made by the trustee which comprise the certificate may be relied on as fact. Recipients of a certificate of trust may request the supporting excerpts from the trust instrument that designate the trustee and confer the relevant powers upon the trustee. A trustee is also required to give notice of any amendment or revocation of a certificate pursuant to 14A V.S.A. 10-1013(d). 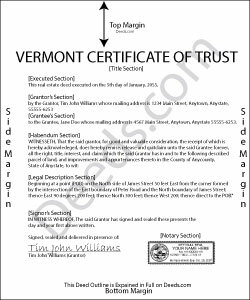 Consult a lawyer with questions concerning trusts and certifications of trust in Vermont. Leo b. said: Awesome site great paperwork EZ Forms great. Reply from Staff: Thank you Leo. James J. said: The form itself was very good and easy to use. The only problem I had was the Sample they provided. Using a different name in every spot doesnt help determine what goes where. Using "Theodore Rockafeller" as Lien Claimant in one spot and Jebediah Finklestein in another then Harvey Johnson in the last spot is confusing if you really need a helpful sample. Reply from Staff: Thank you for your feedback James. We will have staff review the completed example to see if we can make it more helpful. Have a great day!